Of course, secularization is not just about wealth. As Norris and Inglehart argue, the more that governments or nations take on the role of providing existential security to residents, the less need residents have for religion. Or, as a number of scholars have argued, the United States is an outlier for another reason: it has a unique religious market. Because of a lack of government involvement in state religion plus the protection for freedom of religion, religious groups have been free to compete. This competition leads to innovation and religious groups compete for attendees and resources. hand, Americans with college degrees report attending religious services as often as Americans with less education. Moreover, the majority of American adults (71%) identify as Christians. And among Christians, those with higher levels of education appear to be just as religious as those with less schooling, on average. In fact, highly educated Christians are more likely than less-educated Christians to say they are weekly churchgoers. There is a two part process with this data. First, it has to be collected, analyzed, and reported. On the face, it seems to contradict some long-held ideas within sociology and other fields that increasing levels of education would reduce religiosity. Second, however, is perhaps the tougher task of interpretation. Why is this the case among Christians and not other groups? What about the differences between Christian traditions? How exactly is religion linked to education – does the education reinforce religiosity or are they separate spheres for Christians (among other possibilities)? Data is indeed helpful but proper explanation can often take much longer. McVeigh and coauthors, Kraig Beyerlein, Burrel Vann and Priyamvada Trivedi, examine why certain U.S. counties are conducive to the establishment of Tea Party organizations. Their statistical analyses show that even after accounting for many other factors, Tea Party organizations were much more likely to form in counties with high levels of residential segregation based on education levels, and that college graduates were more likely to indicate support for the Tea Party if they resided in a county characterized by high levels of educational segregation. “Acceptance or rejection of the Tea Party’s views on the government’s role in redistributing wealth is shaped, to a large degree, by the extent to which those who have benefited from higher education are set apart in their daily lives from those who have not,” says McVeigh, who specializes in inequality, social movements, race and ethnicity. I noticed this because that sneaky factor of residential segregation proves influential again. The average resident may not think about it much beyond the immediate value of their home or the nearby school district but where one lives can influence a lot about social life, including with whom you interact. College graduates were over 5 times more likely to leave the bottom rung than non-college graduates. Dual-earner families were over 3 times more likely to leave the bottom rung than single-earner families. Whites were 2 times more likely to leave the bottom rung than blacks. Additionally, Pew’s analysis examined the intersection between income and wealth, and found that the health of family balance sheets—including accumulated savings and wealth—are related to income mobility prospects. Households with financial capital, such as liquid savings or other readily available assets such as stocks, were more likely to leave the bottom of the economic ladder. 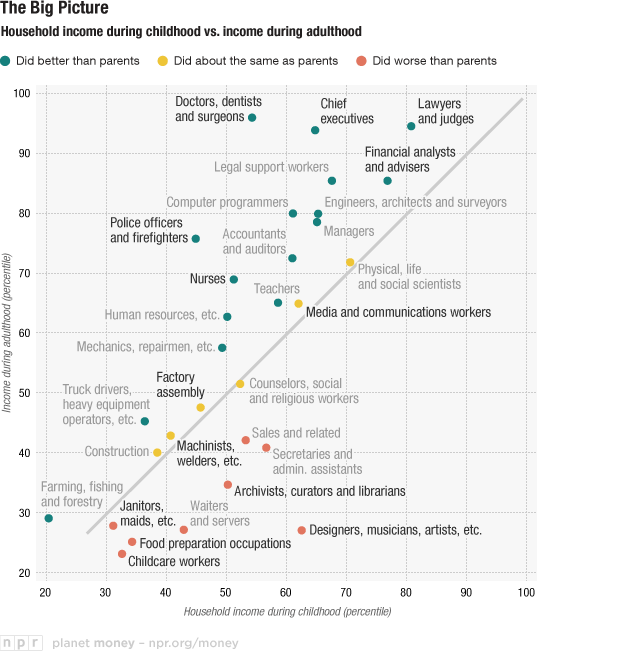 In other words, movement up the income and wealth ladders was connected, and economically secure families were also the most likely to be upwardly mobile. The Census Bureau’s latest data tracking internet and computer use in American homes suggest that both have become ubiquitous with impressive speed. About three-fourths of American households now boast both technologies, according to the Current Population Survey’s data, collected through late 2012. That’s up from 8.2 percent for computers back in 1984, and 18 percent for the Internet in 1997, when most of us who were online were dialing up to get there. This is a persistent issue: those with fewer resources are not able to take advantage of what is available online. This becomes more and more problematic as all sorts of information and government services are accessed primarily through the Internet. Additionally, kids in lower income and education households don’t get as much exposure to the Internet. It will be interesting to see if that number of Americans who say they don’t want the Internet changes in the near future. It may drop as more people see it as necessary. But, it might also rise if people see the Internet as a nuisance or is still better accessed elsewhere (like at a library).